The first page of the first issue of JM DeMatteis’ terrific run on The Defenders. You may remember him from such triumphant comic books as “Kraven’s Last Hunt,” the Eisner-winning “Formerly Known as the Justice League” and all the sequels (I Can’t Believe It’s Not…; International; etc. ), and a nice little run on Captain America. He starts strong: Eternity has broken himself into fragments, and each member of The Defenders has to go find a piece of him. Eternity did this to himself to discover what it was like to be mortal but now, being turned into six mortals, he needs help to become whole again. 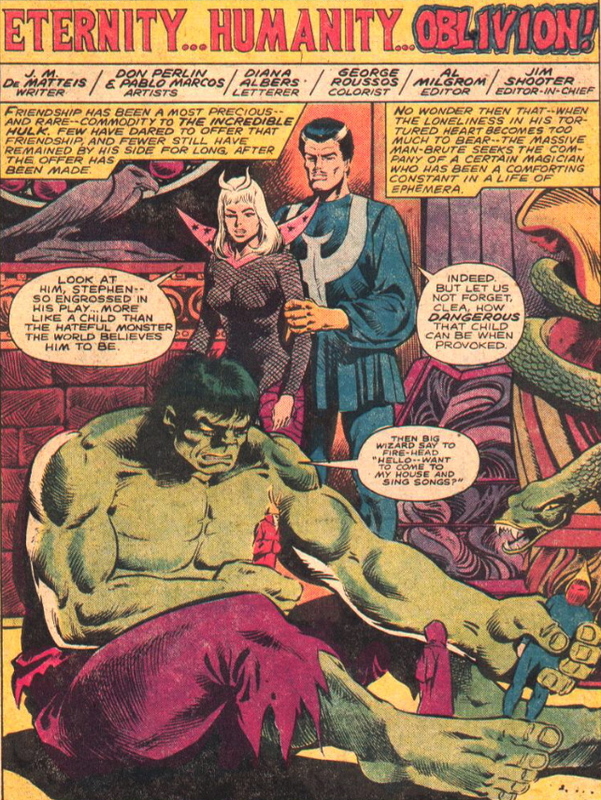 Because six separate tasks stand before them, Strange goes to Namor and Silver Surfer to ask for help, so basically DeMatteis uses this issue to play with all the toys in the Defenders box. It’s a nice way to begin a run on a title–particularly since nobody has been using a lot of these characters for years.